Heat half the butter in a pan. Cook the shallots for 1 minute. Add the champagne and any remaining oyster juices, tarragon and seasoning. Bring to the boil and simmer until the liquid is reduced by half. Add the oysters to the pan and cook gently for 2 minutes. Spoon each oyster back into the shell. Increase the heat and whisk the remaining butter into the sauce, a little at a time. 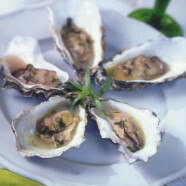 Pour the sauce over the oysters, garnish with fresh tarragon and serve as a starter with crusty bread.